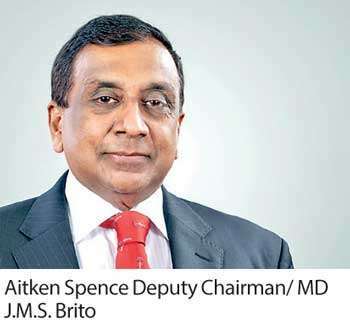 Harry Jayawardena-controlled diversified conglomerate Aitken Spence PLC recorded strong top and bottom line growth for the quarter ended December 31, 2019 (3Q19), backed by improved performance in all its four key business segments. Earnings during the quarter under review rose Rs.3.12 a share or Rs.1.3 billion compared to Rs.2 per share or Rs.812.2 million recorded for the corresponding quarter last year (3Q18). The revenue for the period rose to Rs.13.7 billion from Rs.12.2 billion in 3Q18, while operating profit improved to Rs.2.4 billion from Rs.1.6 billion helped by other operating income worth Rs.455.8 million. Meanwhile, for the nine months ended December 31, 2018, the group reported earnings of Rs.5.41 per share or Rs.2.2 billion compared to Rs.4.31 a share or Rs.1.75 billion a year earlier. The revenue during the period rose to Rs.36.6 billion from Rs.36.1 billion while other operating income rose to Rs.917.2 million from Rs.609.6 million. A segmental analysis of the nine months results showed the group’s tourism sector generating total revenue of Rs.20.3 billion compared to Rs.18.3 billion a year ago. However, the after-tax profit of the segment fell to Rs.384.7 million from Rs.547.2 million a year ago. Aitken Spence said the tourism sector growth was driven by a strong performance by the destination management segment consisting of Aitken Spence Travels which has increased the number of tourists handled steadily over last few years. “Whilst Aitken Spence Resorts in the Maldives continued to perform well in spite of increased international competition, the Sri Lankan hotels segment improved its financial results over the previous year, during period under review,” an earnings release said. The company’s latest addition to the hospitality portfolio, Heritance Aarah that presents a premium all-inclusive offering, is expected to open next month as the first Heritance property in the Maldives. The group’s maritime and logistics sector recorded higher revenue of Rs.8.7 billion for the nine months ended December 31, 2018 while post-tax profit improved to Rs.1.16 billion. “The maritime & logistics sector posted growth in both top and bottom lines with improved results from maritime services, cargo and logistics segments,” earnings release said. Aitken Spence is one of the largest integrated logistics service providers in Sri Lanka. The strategic investment segment reported a post-tax profit of Rs.1.1 billion against Rs.855 million a year ago. However the segment’s revenue fell to Rs.11.5 billion from Rs.13.8 billion a year ago. Strategic investments sector includes power generation, plantations, printing and garments. Aitken Spence is currently in the process of constructing a 10MW waste-to-energy plant. The project would be equipped to convert municipal solid waste to electricity, aimed at greatly relieving the Colombo City of its waste disposal burden. Also, the waste-to-energy plant will add to the current portfolio of hydro, thermal and wind power plants developed and run by Aitken Spence. Meanwhile, the earnings release said Aitken Spence recently entered into a joint venture with Fijian Holdings – one of Fiji’s leading conglomerates to invest in and manage the government printery in Fiji. Jayawardena-controlled Melstacorp Limited, Rubicond Enterprises Limited and other related parties collectively held over 67 percent of Aitken Spence as at December 31, 2018, while the Employees’ Provident Fund held 5.07 percent stake being the third largest shareholder.